In "Buried Truths," Pulitzer Prize-winning author, journalist and professor Hank Klibanoff explores racially motivated murders that went unpunished in the Jim Crow South. Photo courtesy WABE. “Buried Truths,” a podcast led by Emory professor Hank Klibanoff, has been honored as a nominee for the prestigious Peabody Awards, which celebrate “the most compelling and empowering stories released in broadcast and digital media in 2018.” The podcast explores cases that have been investigated by Klibanoff and the undergraduate students in his Georgia Civil Rights Cold Cases Project class. 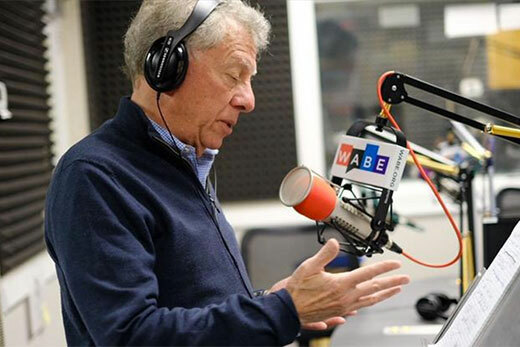 “Buried Truths,” produced by Public Broadcasting Atlanta’s WABE-FM, is one of 11 nominees in the radio/podcast category. Overall, there are 60 nominees for this year’s Peabody Awards, selected unanimously by 19 jurors from more than 1,200 entries. Winners in the categories of news, radio/podcast, web and public service programming will be announced April 23. Winners and nominees will also be honored May 18 at a gala event in New York City hosted by investigative reporter Ronan Farrow. “Buried Truths,” now in its second season, examines racially motivated crimes in Georgia during the civil rights era. The podcast, and the Emory course on which it is based, are not focused on solving crimes — for many of these cases, the assailants are known — but rather seek to understand how and why such crimes went unpunished in the Jim Crow South. Season 1 told the story of Isaiah Nixon, an African-American husband and father of six who exercised his right to vote in rural Georgia in 1948 and was killed for doing so. When his family fled to Florida in the wake of the killing, his grave was lost to time, until it was discovered by a student in Klibanoff’s cold cases class in 2015. Season 2, which launched Feb. 18 and has new episodes released weekly through April 15, tells the story of A.C. Hall, an African American teen who was shot by police in Macon, Georgia, in 1962 after he was mistakenly identified as stealing a gun. Through Hall’s story, Klibanoff examines police privilege, racial conditioning, community activism and more. A journalist for more than 35 years, Klibanoff now serves as professor of practice in English and creative writing at Emory. He co-authored “The Race Beat: The Press, the Civil Rights Struggle, and the Awakening of a Nation,” which won the 2007 Pulitzer Prize for history. “Buried Truths” is produced by WABE’s David Barasoain and written by Klibanoff and Richard Halicks. The editor is Marilyn Geewax. The executive producers are Christine Dempsey and Je-Anne Berry. The podcast has received more than one million downloads and is available on all major podcast players, including Apple Podcasts, Google Play Music, NPR One and Stitcher. It is also on WABE’s website: wabe.org/buriedtruths.